The goal of MoDOT’s bid opening and award process is to achieve competitive bids by packaging projects in a manner that makes them as attractive as possible to potential bidders. Methods of achieving this goal include, but are not limited to, establishing appropriate bid opening dates for the type of work, maintaining a stable bid opening schedule, and grouping or dividing projects to make them more appealing to bidders. Design will conduct bid openings for all projects within the right-of-way of the state highway system, with two exceptions. Districts may conduct bid openings for “maintenance by contract” projects that cost less than $25,000 or in the case of an “emergency”. All other contracted work must be included in the regularly scheduled monthly bid openings held in Jefferson City. There is risk to the safety of the motoring public. In most cases, standard advertising requirements may be shortened for emergency projects. The Design Division will work with the district to determine an appropriate advertising period for emergency projects on a case-by-case basis. It should be noted, bid guaranties (bid bonds) and contract bonds are required on all projects, including emergency projects. For maintenance funded contract work with an estimated cost of $25,000 or less, most aspects of the bid opening (i.e. advertising, proposal preparation, opening and award) can be performed in the district. However, Design Division staff is available to assist the district with these items or to perform them for the district. Advertising for these projects shall follow the provisions contained in EPG 103.1.7. In addition, bid guaranties (bid bonds) and contract bonds are required on all projects, including maintenance by contract projects. In addition, projects should be combined into efficient combinations so contractors can provide cost effective bids. Contract time needed for project completion, including the time a contractor needs to secure the required materials. EPG 103.1.3.2 provides guidelines for target award quarters depending on contract time. Date when plans, specifications and estimate are complete, right of way clear, utilities clear, agreements executed. Uniform availability of work around the state (reviewed by the Design Division). Availability of funding. The district should work with the Transportation Planning Division to ensure funding is available and to include projects in the Statewide Transportation Improvement Program. Once a project has been programmed in the Statewide Transportation Improvement Program, it is a MoDOT commitment. Further, contractors plan their work according to the bid opening schedule so maintaining its stability is crucial to receiving competitive bids. Every effort must be made to deliver the project on time and within budget. However, if circumstances require a project not be let at the committed bid opening date, the district shall request a change in the bid opening schedule through Transportation Planning. The District Engineer must approve jobs moving to a new fiscal year. It is desirable to “package” projects to make them as attractive to bidders as possible, particularly in areas of the state with limited competition. Design is available for consultation in determining prospective bid competition. Similarly the Design Division can assist the district in developing attractively packaged projects. Small projects may need to be combined, while large projects may need to be split apart. Materials availability is also a concern when scheduling certain work types. The number of different work types should be reduced as much as practical (i.e., a small quantity of asphalt with a small quantity of concrete). For certain particularly complex projects, there is a benefit to having one contractor in charge of the entire project. Required combinations are recommended for several small projects with similar work within a reasonable distance from one another. Packaging them together often makes them “economically attractive” to more bidders. Required combinations are also helpful when combining a medium to large project with a single small project in an area. The small project alone may not attract any bidders. Combining it with a more desirable project will increase its chance of being completed. All district plans, consultant plans, bridge plans, and any utility relocation or other miscellaneous plans, job special provisions, and estimates have been submitted. The status of R/W, utilities, and railroad work has been submitted. If the contractor's access to the project is limited due to right of way or utility problems the district should refer to the "Commission Procedure for Liability Acceptance") to determine an appropriate plan of action as early in the process as possible. Once the plans have been submitted, a committee consisting of the appropriate Design Liaison Engineer and the Assistant State Design Engineer review the project for applicability to the "Commission Procedure for Liability Acceptance". If a determination of how to proceed cannot be made by this committee, the matter is referred to the Chief Counsel's Office. In either case, at this point it is often too late to cure restrictions on the contractor's ability to have full and free access to the project, thus creating an acceptance of liability risk if the project remains in the scheduled bid opening. If the job special provisions are not or cannot be drafted to adequately deal with these risks, the Chief Counsel's Office will request a delay in the bid opening. Proper Corps of Engineers 404 and Missouri Department of Natural Resources 401 permits have been issued. Municipal, county or other funding agreements have been executed, and funds have been deposited as required by the agreement. The orange-covered Request for Bid is made up of 3 components: The "boilerplate" contract pages, the itemized bid, and the job special provisions. Preliminary review of plans, specifications and estimate, including the workday study to provide the job description and ensure adequate contract time. Obtain the required DBE percentage and trainee goal for the project from the External Civil Rights Office. Insert job number, project description, bid opening date, contract time, liquidated damages, and DBE percentage/Trainee Goal into a standard format for either a federal-aid or state project contract. Ensure all supporting documents are included with the Request for Bid, including any necessary permits, asbestos survey inspection sheets, electronic geotechnical data, etc. Check that quantities on 2B sheets match quantities and pay items on the estimate and tabulation of quantities. Verify that all pay item numbers are on the current listing of standard pay items. Verify all lines on the itemized bid list are consistent with the bidding proposal and include lines for “section total” for roadway items and “section total” for bridge items”, etc. Add coding for permitted/required combinations and alternate paving jobs. Ensure estimate split-outs for financing by others are calculated correctly. Create itemized bid sheets for Request for Bid. Proofread job special provisions, and format where necessary. Ensure that the current standardized job special provisions are used. Spot check for commonly missed job special provisions. Add appropriate "General" special provision indicating current required wage rate provisions and other job special provisions to be inserted by Central Office. The blue-covered Bid Proposal is assembled by the Bidding and Contract Services unit and is used by the contractor to submit their bid. It is identical to the Request for Bid, except that it does not include the job special provisions. In addition, the pages to be filled out by the bidder are printed on colored paper. Verify pavement design and typical sections concur with the pavement group recommendation. Check plans against title sheet index to be sure all plans have been included. Combine bridge plans with roadway plans. Ensure plans have been signed and sealed. Verify that the most current standard plan sheets and other special sheets have been used. Review plans for commonly missed items. Create 2A sheet from the estimate. Under ideal circumstances, it should take approximately a week to process a set of plans and a day or two to print the bidding documents, allowing a minimum of two weeks for review of and changes to the preliminary bidding documents prior to advertising the project for bid opening. A chart identifying the bid opening dates, PS&E due dates and print dates is established by the Design Division. It is important that the districts comply with this schedule to ensure efficient processing and printing of the projects. Once the bid documents are complete, the Design Division posts an electronic version of the itemized proposal for each project on MoDOT’s website. These files may be downloaded and completed by contractors using ExpediteTM software. A contractor may print a copy of his completed itemized proposal and return it as part of his submitted bid. Advantages to using the electronic itemized proposal include: less data entry time for the contractor, less chance for mathematical errors and omissions in the bidding process and more legible bids. The contractor may submit bids electronically via the internet. Bids submitted electronically shall use the latest version of Trns Port Expedite Bid, and be submitted using the BidExpress® website. Guidelines for How To Submit Bids Electronically are available on MoDOT’s website. The Design Division also provides electronic files of bidding documents to approved external groups that post them in private electronic plans rooms. These electronic plans rooms allow subscribing members to view electronic versions of bidding documents and order printed versions of the documents. Advantages to sharing the documents in these electronic plan rooms include: quick access to bidding documents by potential bidders, communications with a broader competition base and better opportunities for connections between prime contractors and subcontractors. The method of correcting errors in bidding documents is dependent on both the magnitude of the error, and when the error is discovered. The Bidding and Contract Services unit will evaluate whether a change to the bidding documents is necessary and what impacts the addendum may have on the bid. If the error is discovered before the bidding documents are printed, the correction is fairly simple unless it requires redesign and re-submittal of signed and sealed plans, specifications and estimate. This will require from a few days to several weeks. 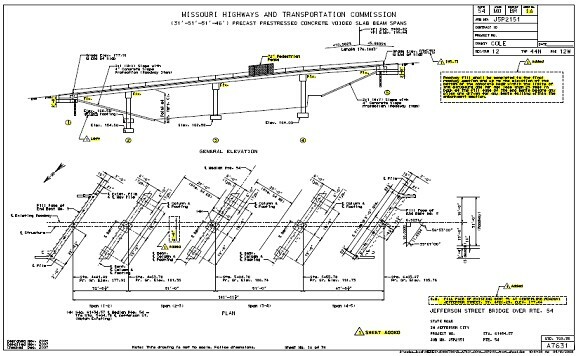 If the error is discovered after the project is advertised, then the change has to be made manually to the bidding documents as described above, plus it must be sent as an addendum by express mail or “return-receipt” fax to all plan holders and an electronic copy of the addendum are posted to the MoDOT web site, which is a complicated and costly process. If the express mail receipt or fax form is not returned, the plan holders must be contacted by telephone to verify whether or not the addendum was received, and if not, the addendum must be re-faxed to that bidder. Bids that do not include all addenda issued may be declared non-responsive, and again, the result may be unfair competition. If the error is undetected by MoDOT, but is recognized by a few of the bidders, the result is unfair competition. The bidders that are aware of the error may unbalance their bids, again resulting in unfair competition. is at risk of criticism from FHWA and the State Auditor that MoDOT added work to a contract that did not go through the required competitive bidding process. MoDOT clearly identifies revisions to the plans, specifications and estimate when issuing addendums (or kites). Clearly identified addendums avoid confusion for the bidders, especially when the addendums are issued only 1 to 1 ½ weeks prior to the bid opening. The following indicates the process for identifying the various revisions to the plans, specifications and estimate. The designer should use a triangle with the corresponding number of the addendum to identify any changes on the plan sheet. All revisions for the first addendum will be identified with a triangle and a “1” in it, all revisions for the second addendum with a “2” in it, revisions for the third addendum with a “3” in it, etc. To keep from having several revised dates on various plan sheets, the date will only be specified in the revision letter issued by Design. No revised date will be specified on the plan sheets. Below are examples of how the revisions should be identified. The revised new quantity should be located by the triangle symbol and outlined with a solid line. The existing quantity should be outlined with a dashed line. If there are multiple revisions to a plan sheet and it would be clearer to create a new plan sheet, the district should mark an “X” through the existing plan sheet and create a new plan sheet. The deleted sheet should be designated with the triangle symbol and the note “Delete Sheet”. Do not delete the original file in ProjectWise. The deleted sheet with the “X” marked through it should contain the engineer’s seal. The new sheet should be designated with a note “Add Sheet” and the sheet number updated with an “A” (i.e., if deleting Sheet 21, then new sheet number will be 21A). The file name for the first addendum must be changed to add a _R001 at the end of the existing file name. The second addendum will need a _R002 added to the end of the file name, etc. The user must create a duplicate file with the new file naming convention as the program will no longer automatically generate the new file name. The user will make the changes necessary for the addendum to the duplicate file. Examples of the file names for the first addendum are shown below. 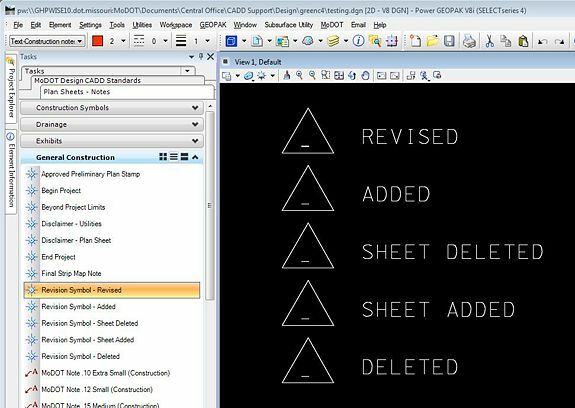 CADD has created the “revision” notes in MicroStation to simplify the process and also to ensure consistency in the font and size of notes used for the revisions. The revision cells for addendums are located under the Tasks in MicroStation. 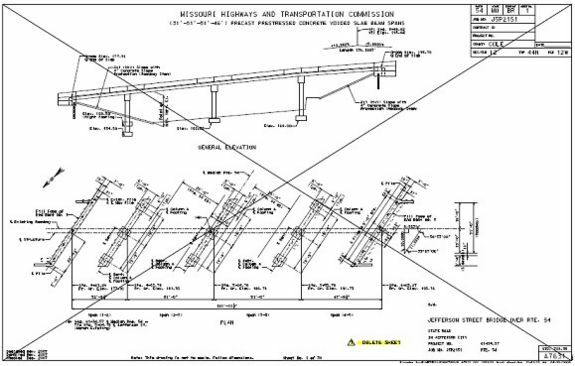 The cells are stored under the following group as shown in the image below (Tasks / MoDOT Design CADD Standards / Plan Sheets – Notes / General Construction). The district should strike through any deletions and identify any changes or additions on the existing copy of the estimate, then e-mail a pdf of the revised marked-up estimate to the reviewer. Once all revisions have been finalized, the project manager shall notify the reviewer via e-mail that the addendum is ready for processing. Under state law, projects must be advertised for bid opening in a newspaper published in the county in which the project will be constructed. Further, FHWA requires a project be advertised at least three weeks before bids are to be received. In addition to newspaper advertisements, MoDOT also issues a Notice of Bid Opening, which is available on the MoDOT web site. MoDOT, at the request of the AGC, has chosen to generally use a 5-week advertising period to allow contractors adequate time to properly prepare their bids. Once the project has been advertised for bid opening, contractors and suppliers may purchase the Contract Plans or Requests for Bid. All purchases of Requests for Bid or Contract Plans are recorded. When ordering the plans, the contractor has the option to be identified as a plan holder. This "Plan Holders List" is presently available to the public and is located on MoDOT’s website. 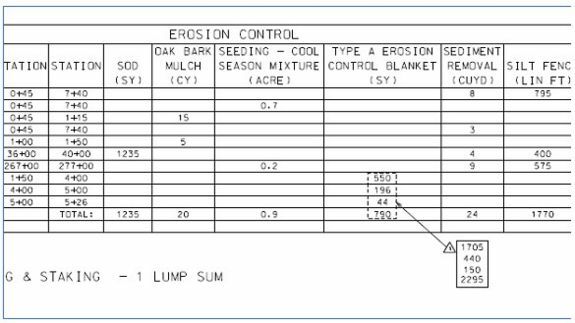 Utilizing cost base analysis and past history of project specific items. Conducting field checks of potentially complex projects. Continuous communication with contractors and suppliers concerning construction techniques and availability of materials. Bidders may submit paper bids or bids electronically using the BidExpress® website. Only bidders who have a Contractor Questionnaire on file seven days before bid opening are permitted to submit bids for a project. The list of qualified bidders is kept by the Central Office Construction Division and provided to the Secretary to the Commission. Bidders that choose to submit bids via the internet shall have on file with the Commission an “Internet Bidding Agreement”, a copy of which can be found on MoDOT’s website. This agreement shall be initiated by the prospective bidder and submitted to the Commission. A bid will not be opened and read unless a fully executed agreement is on file with the Commission at least seven days prior to the time set for the opening of the bids. Paper bids are delivered to the Commission Secretary's Office by 11:00 a.m. on bid opening day, and qualified bids are logged in as they arrive. At 11:00 a.m. the paper bids are opened and the electronic bids are uploaded from the BidExpress® website. All bids are given a cursory check to ensure all required documents are submitted by the bidder. The bids are then marked for public reading by the State Design Engineer. Bids are read in the Commission Hearing Room to an audience of mostly contractors. The "Bids As Read" report is available on the Internet and as a printed document during the bid opening process. The Bids as Read on the BidExpress® website are called Apparent Bid Results and are generated immediately after all bids are uploaded during the letting. MoDOT also generates the Bids as Read report and posts it to the MoDOT website, generally no later than 12:00 noon. MoDOT’s Bids as Read report provides additional information that is not provided on the BidExpress® website, including maximum monetary bond and the pavement type for alternate bid projects. Guidelines for viewing the two versions of Bids As Read are posted on MoDOT’s website. Each individual item of the paper bids is then entered into the computer. Any discrepancy between bids as read, and bids as tabulated through the computer, are investigated and resolved by the Bidding and Contract Services unit. The bids as tabulated through the computer are the official bids. "Bid Tabulations" which show itemized bids are then printed, along with the "Summary of Bid Opening" which shows the totals for the low and second low bidder for each job. The total bids shown on the Summary of Bid Opening are public information. However, the individual item bids shown on the Bid Tabulations are not made public until the Commission awards a project. These items are not made public when the Commission rejects all bids for a project. A confidential report showing an itemized comparison of the low bid to the final engineer's estimate is produced for bid analysis purposes. Once the Commission awards or rejects the projects at the Commission meeting, the Bid Awards and Bid Tabulations for awarded projects are distributed. Letters are prepared to contractors who have been awarded jobs informing them of their notice to proceed date, and the bid opening information is posted to the MODOT web site by the Design Division. Bids deviate from the final engineers estimate, sometimes significantly, for many reasons. Consideration of the number and quality of bidders, and the disparity among the bidders is the first step of the overall analysis. After this step, the low bidder's price for each individual item is compared to the final engineer's estimate for these items. The Bidding and Contract Services unit notes major deviations and irregularities, such as unbalanced bidding, and investigates, as necessary. Information concerning these situations, when detected, is discussed with the appropriate Central Office personnel and can be grounds for rejection of the bid on a project. Contract Services staff meets with the State Design Engineer after a thorough review of the bids, to discuss the bids received and make their recommendations for project awards. The State Design Engineer discusses the bid information with senior managers where the final recommendation to the Commission for award or rejection of the project is drafted. Prior concurrence of the Division Administrator of FHWA is required for there to be a recommendation to award a federal participation project. The final recommendation is presented to the Commission at its monthly meeting, generally one to two weeks following the bid opening. Commissioners are provided with all pertinent information from the bid opening including the final engineer's estimate. After the recommendations are presented, the Commission decides whether to award a contract for construction or reject bids on individual projects. The Commission reserves the right to award or reject any or all bids on any project. A meeting with the low bidder may be held following the Commission’s action on projects that are rejected. The meeting involves Central Office staff, district staff, and the contractor. They discuss any items that were bid excessively high or ways to improve the constructability of the project. These ideas may then be incorporated into a future request for bids on the project. Sec. 103 of the Missouri Standard Specifications for Highway Construction outlines procedures and obligations involved in the award of a contract to the successful bidder. The resident engineer will be advised of award of a contract upon receiving offical notice that the contractor may proceed with the work. This page was last modified on 5 December 2018, at 13:52.